DO-39755-96 was succesfully added to your cart. The TG165 and TG167 takes you beyond the limitations of a single spot IR thermometer. 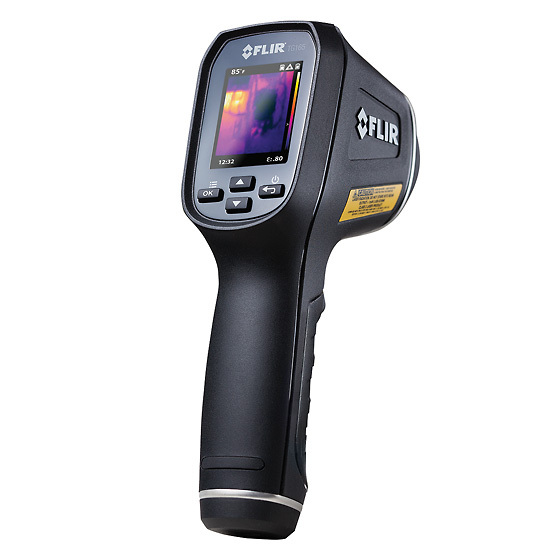 Equipped with Flir's exclusive Lepton™ micro thermal camera, it allows you to see clear thermal patterns of heat problems normally invisible to the eye. The 24 to 1 distance to target ratio and 80 x 60 image resolution helps you capture reliable readings from a safe distance and still see thermal patterns clearly. The intuitive icon menu system, dual targeting lasers and on-screen temperature measurement crosshair makes the TG very simple to operate. Other features include selectable color palette, emissivity adjustment, selectable temperature scale and image hold. Images are stored to a micro SD card for easy download to PC, letting you efficiently document problems.What's included: 2 GB micro SD card, USB cable, lanyard, soft carrying case, international battery charger and built-in rechargeable battery. Can this camera detect leaks in walls? If the leak is at a different temperature then the surrounding area then yes it will.